Egypt’s Military Council has imposed a curfew in Abbasiya district, following an outbreak of violence that left two people dead and some 300 injured. The military used water cannon and tear gas to stop the crowd from reaching the Ministry of Defense. At least two people have been killed in clashes AFP reports, citing hospital officials. According to at the al-Zahra University Hospital the two died from gunshot wounds. However, the Health Ministry so far has confirmed only one death saying a soldier was shot dead. 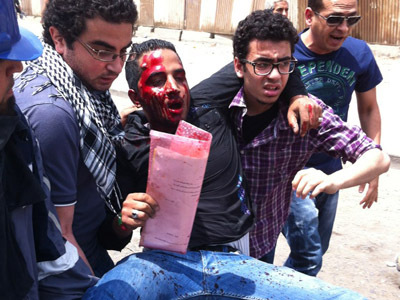 The officials put the number of wounded at 296, Al Arabiya’s sources say. The security forces have also arrested some 170 people during Friday’s unrest. They are currently being interrogated by the military. In the face of the insurgency, the Supreme Council of the Armed Forces has issued a statement imposing a curfew in the central Cairo neighborhood of Abbasiya from 11pm Friday to 7am Saturday local time. In the address SCAF described the actions of the protesters as a “threat to the nation and the people” of Egypt and urged the citizens to cooperate with the authorities. The army has warned against defying the orders and violating the curfew, saying that legal measures will be taken against transgressors. The SCAF maintains that the violence erupted after some “irresponsible elements” armed with firebombs and rocks tried to cut through the barbwire barricade outside the Ministry of Defense. 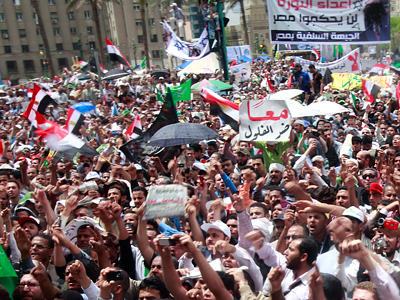 Thousands of Egyptians protested on Friday demanding the Military Council hand over power to civilians. 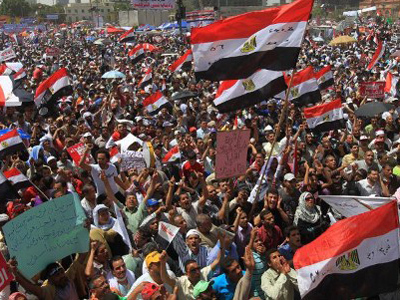 Initially the crowd had gathered in the Tahrir Square, but later the protesters attempted to reach the Ministry of Defense. There they were stopped by security forces firing water cannon and tear gas. Local TV showed troops dragging one protester away, beating him with metal sticks, tearing his clothes and leaving his back bloodied. Protesters responded to the violence by throwing stones at the police. After a few hours of fighting, the troops managed to push the protesters away from the Ministry of Defense. The protesters retreated from the square to nearby streets. According to some witness reports either the military or the protesters were using guns during the conflict. “Panicked stampedes running thru streets. Sounds of gunfire everywhere, from every direction. Complete chaos," said @liamstack. "Military completely clears sit-in with tear gas and attacks. Sound of gunfire fills air. 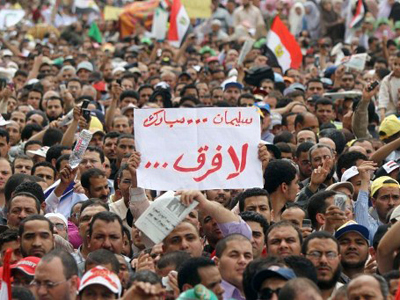 Crowd runs into streets of Abbasiya," wrote @sharifkouddous. Reports of heavy gunfire were also confirmed by AFP. The armed forces intensified their presence near the ministry after the Supreme Council of the Armed Forces warned Egyptians on Thursday to stay away from the military facilities and protest in Tahrir Square instead. Egypt is seeing a marked escalation of violence ahead of the presidential elections later this month. 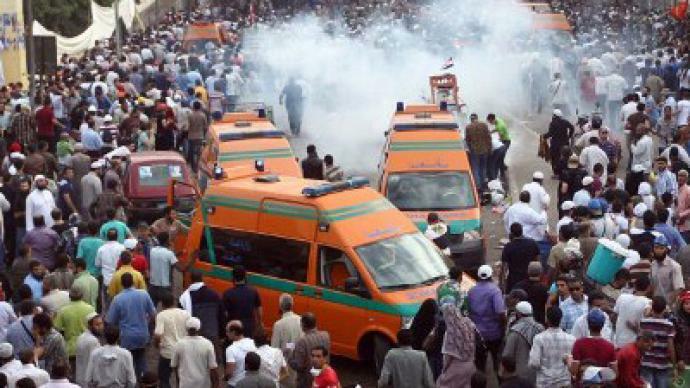 At least 20 people have been killed and over 100 wounded after an unidentified group of armed attackers opened fire on peaceful protesters near the Ministry of Defense on Wednesday. ­The SCAF has pledged to transfer power on May 24 if one of the 13 candidates wins in the first round of the presidential election. The anger against the SCAF generals is rising and more people are joining the protest movement, Sabry Khaled, a revolutionary social activist, told RT. He believes that the response of the security forces to a peaceful sit-in shows that the SCAF generals are afraid that a civilian government, when elected, will not give them a “safe exit” from power. RT: Almost monthly we see the same succession of events: protests-violence-deaths, yet a parliamentary election's been held, a presidential one is weeks away. Who is behind the conflict-driven impatience do you think? What is driving it? Sabry Khaled: It is clear that the SCAF do not want to hand power to a civilian government or a civilian president who will not give them a safe exit. They are afraid and the people know that they are afraid. People in the streets now do not want a safe exit for the SCAF. The whole thing now started by a peaceful protest, and then they [the security forces] just attacked peaceful people who were having a sit-in near the Ministry of Defense. The combination of the people now in the protest is a little bit different than before. 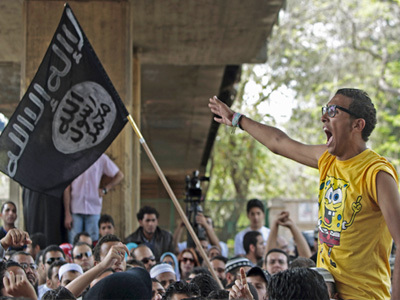 Before most of them were just civil movements but now more Islamists are joining the protests. And this will show us how the allies of the SCAF just after the revolution now are turning on them. ­The anger surrounding Egypt’s military rule has been building up for the past year and the military was the aggressor every time peaceful protests erupted into violent clashes, believes blogger and opposition activist Gihan Ibrahim. RT: Today we have clearly seen pictures of crowds of protesters boiling over with aggression, throwing stones at police. But activists are blaming the security forces for provoking the clashes. Who is to blame? Gihan Ibrahim: The clashes in any of the sit-ins or demonstrations that have happened in Egypt for over a year and a half have been always… The violence always erupts from the military trying to evacuate or basically disperse the protesters from demonstrating against military rule or against any kind of subject. So this is exactly what happened. There was a sit-in going on. It was peaceful for many days. And some sort of friction started and then all these violent images that you see right now are being done by the military personnel and the riot police against these protesters. And many are being injured and many have died in the past few days.